Having already visited Glenkinchie on numerous occasions and Auchentoshan it was only fitting that we complete the Lowland trio with a stop at Bladnoch Distillery. Following a recent trip home to Manchester, England for a surprise 60th Birthday party for my Mother and a fortuitously timed visit to the Pearl City our favourite restaurant in Chinatown coinciding with the Chinese New Year celebrations, we decided to take a little detour on the road home. Basically Bladnoch is nowhere near any other (operating) distillery though historically there were many in South West Scotland, news is that the old Annandale site near Annan is currently being resurrected (see http://www.annandaledistillery.co.uk/index/welcome/) and hopes to be distilling in 2015. I can’t take credit for the idea of detouring to Bladnoch, Iain Banks did exactly the same for his book Raw Spirit. 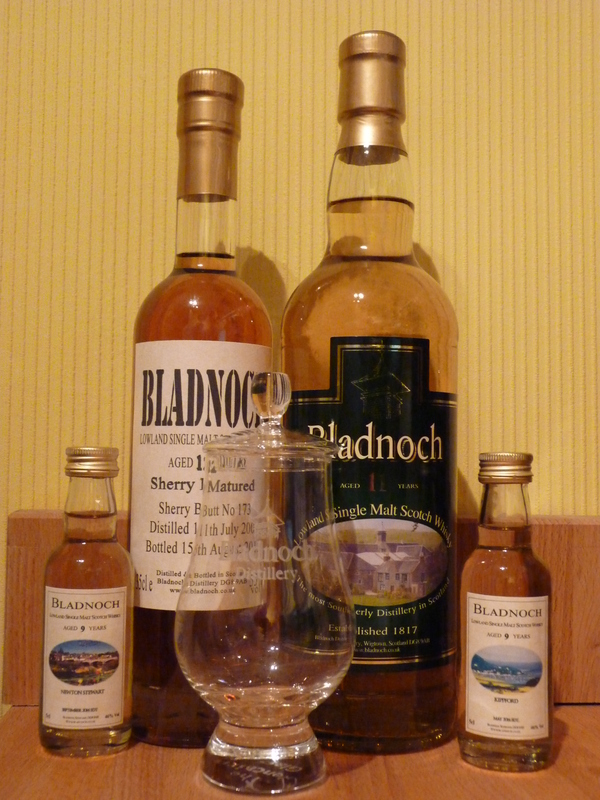 Bladnoch itself is around 1 and 1/2 hours from the M74 at Gretna and about 2 and 1/2 from our home in Livingston. Unfortunately the day we decided to go (3rd February 2014) was beautiful in the rest of the UK whereas the entire UK’s rainfall was dropping between Castle Douglas and the Irish Sea! Needless to say just as we arrived the river decided to behave itself, stopping the flow of water backwards through the whole distillery site and get back into it’s riverbed where it belonged. Today the restriction on alcohol production may have lifted as the original stipulation was only in effect for 10 years after the sale, however fluctuations in barley and fuel prices as well as the relatively very very full status of the warehouses on site have been having a negative effect on the amount of actual distilling being performed. During our whistle-stop tour we had the chance to have a good look into the stills and mash tun, the 6 washbacks had been filled with water to prevent their wood (presumably oregan pine) from drying out, plus the rather unusual stainless steel spirit safe (most others we have seen have been brass). 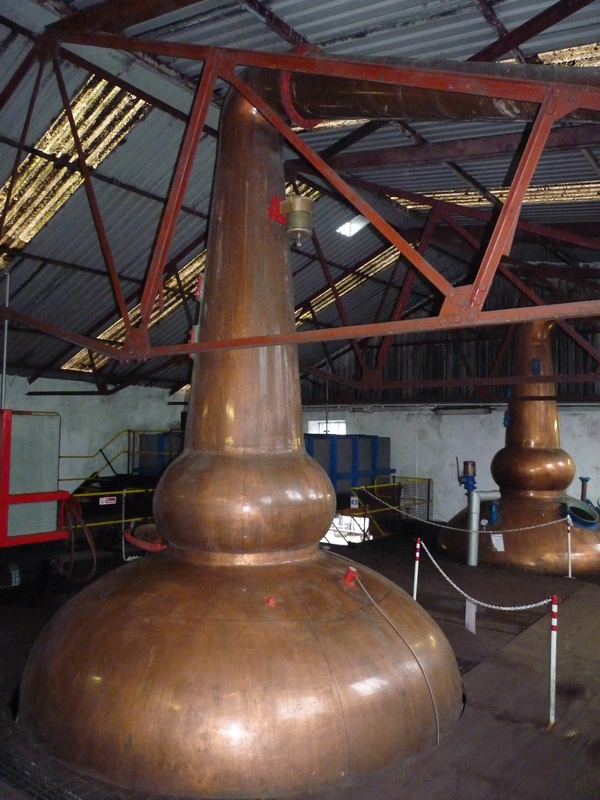 We were also given an excellent opportunity to view all of the equipment including mash-tun and both stills inside and out as they were cleaned out and serviced during their downtime. Last of all we got to try out a whole series of the expressions that Bladnoch have bottled, including 11 and 12 year old (both bourbon and sherry finished), cask strength, lightly peated and there recent new addition of the 9 Year Old heavily peated whiskies (bottled for the 2013 Drambusters Festival). All of which were truly delicious with that distinct sweetness that comes from Bladnoch distillate pervading all. My particular favourites were surprisingly the bourbon finished whiskies. Normally I would go straight for sherry-finish and I had previously sampled the 11 year old sherry-finish (at 55% ABV). However, the sweetness of Bladnoch really shines out of the complimentary vanilla and coconut flavours of the bourbon-finished whisky. So finally we were left to thank our most gracious tour guide Yolanda who decided it was high-time she got a break from pasting on labels and showed a couple of whisky nuts around the silent distillery for half an hour or so. Lastly back in the shop we got the chance to both stock up on some Bladnoch goodies and be greeted by the Distillery cat Barley, who personally approved our selection. Bladnoch – Barley the distillery cat. Goodies! – someone obviously took their eye off me and forgot to put my mittens on before I got in the shop! Sadly, I had been dawdling a little writing this visit up as we have been so busy with other things. Today (17the March 2014) however, we learnt that due to a differing opinion on how to move forward with the Distillery business, the directors of Bladnoch have split; sending the Distillery into administration. Our thoughts go out to the workers and particularly the Armstrong family and hope soon for a happy resolution to this period in Bladnoch’s illustrious history. Having really just discovered the fabric of this place it would be a great loss (again) if the history of distilling were to close for good on this site. Nice write up of a great distillery. I’ve been reading up on it’s rocky history and hope it gets a buyer to give it the success it deserves!